*MOVE IN READY! * *CAN CLOSE IMMEDIATELY* Offering this BEAUTIFUL HOME at a Tremendous Value Per Square Foot! Don't Miss Out on this Incredible Opportunity! Located in the Well Established and Family Friendly community of Seven Oaks this meticulously maintained 5 bedroom / 4 bath home is just waiting to become yours! The home features an open floor plan and spectacular 2 story entry foyer and a large loft. The 1st floor has beautiful tile throughout. The kitchen offers granite counter tops, tile backsplash, upgraded cabinets and stainless steel appliances. The 2nd floor offers cozy wall to wall carpet. The Master suite includes tray ceilings, a garden tub and spacious walk in closet. A large laundry room on the 2nd floor will help make chores easier. The home resides in the gated Stone Creek subdivision and has a 3-car garage and a covered rear lanai that faces the wooded section of a conservation lot large enough to add a swimming pool. There is a neighborhood playground just around the corner and the Seven Oaks community amenities are second to none! Pools, Resort Style Clubhouse, Gym, Tennis/Basketball and more! 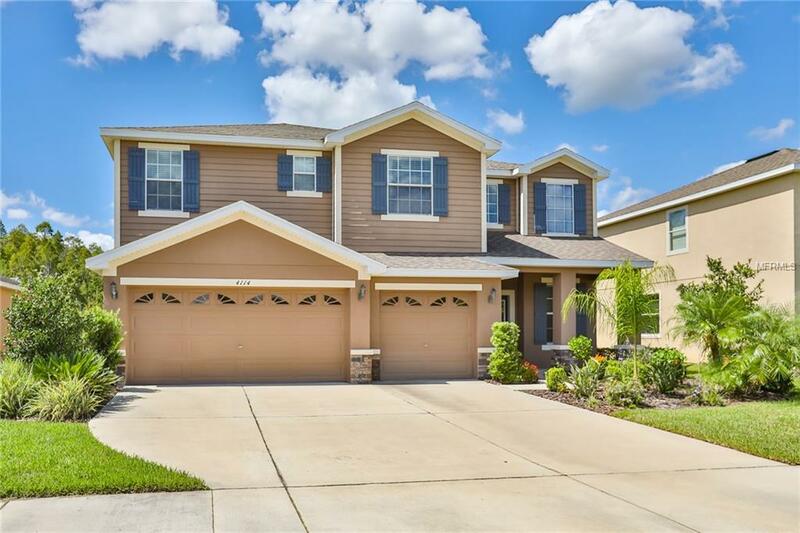 In the heart of Wesley Chapel this home is just down the street from Wiregrass Mall, Tampa Premium Outlets schools, clinics and Florida Hospital Wesley Chapel. With I75/I275 less than 2 miles away you are on Tampa's doorstep! This home is a MUST SEE! Priced Right and ready for you to make Wesley Chapel your new home! Make your appointment today!